"Fifteen million artisanal mining and small scale (ASM) gold miners exist in the world today with a further 100 million people who are dependent on ASM". Small-scale miners extract between 10-15% of the global gold supply chain, yet they make up over 90% of the labour force in gold mining worldwide. For endless ages this sector has struggled as they have not had the ready finance to the necessary and sufficient systems to reach viability. Even where some level of production has been achieved, it is often at the expense of efficiency and the environment. The key is in providing the artisanal mining sector with an efficient, fully comprehensive package that is ready to begin producing right out of the box. Repayment of the investment, and continued viability can then progress smoothly with the necessary input from the artisanals being what they are good at; finding the feed and providing their good work. Note the reference to a system. The end product must be elemental gold which can then be sold and hitherto mercury has been used to produce this from the primary gravity concentrates. If mercury is to be avoided, then an alternative system must be offered to replace it. APT have developed and manufactured such a system, which comprises of the robust and simple GoldKacha concentrator allied to an efficient upgrader called a GoldKonka and finally a small smelting furnace. No mercury is necessary at all. From humid Central American forests to hard baked North African desert plains and steaming Asian jungles there is a cry of triumph in the air.. Viva GoldKacha ! The all new Mk4 GoldKacha is making a stir in entry level mining circles worldwide. 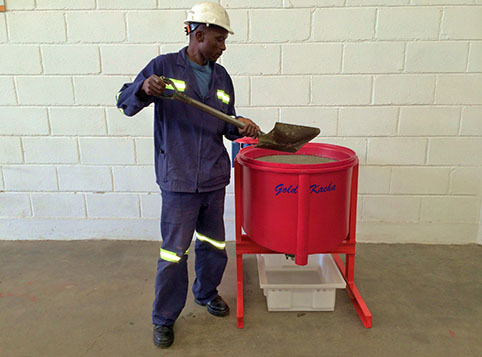 The newly streamlined and ergonomic mineral recovery system is easy to operate and highly efficient on recovery of elluvial and alluvial gold. No special skills are necessary. Family Mining Units are already pooling resources to buy GoldKacha systems. With the gold price set to firm in the near future, artisanal mining and small scale sector miners are seeing an opportunity to cash in and make a good deal more than they have done in the past. The GoldKacha will process between one and three tonnes an hour without the use of mercury and is profitable at as less than 1g/t Au. Age old rudimentary devices such as sluices and had panning dishes are not cutting the cake, they are simply too inefficient and are nearly always combined with the use of mercury. Thinking ASM sector MFU miners have now got the answer but not the tools. APT has managed to reduce the price of the GoldKacha significantly so sponsoring ASM family units is entirely feasible. APT are inviting trade and NGO organisation enquiries, they have tailored special pricing for volume purchase and are implementing supply kit packages to make distribution and availability even easier.